The Congress will be held at the University of Limerick (UL) in the beautiful West of Ireland. You can take a virtual tour of the site here. 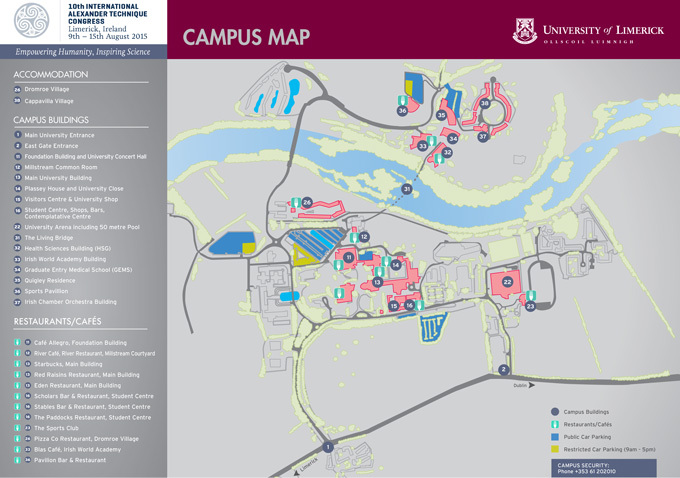 The University of Limerick (UL) campus is a very green campus with plenty of open space and the beautiful River Shannon running through the its centre. It is located approximately 3 miles (5km) from Limerick city centre, in the suburb of Castletroy (see map of suggested walking route). On campus is the Irish World Academy of Music and Dance, which provides a space where musicians, dancers, composers, singers, conductors and choreographers explore together. For details see www.irishworldacademy.ie. Adjacent to the University is the National Technology Park, Ireland's first science/technology park (350 acres), which is home to over 80 organisations, employing almost 3,000 people. Shannon International Airport, the nearest airport, is only 20km away. From there, you can get to UL by taxi or bus (see our how to get there page for further details). Dublin Airport is the next nearest airport, approximately 200km away. There is a direct bus from Dublin Airport to the campus which takes 3.5 hours. Most of the Congress workshops and lectures will be held in a central area near the main University Building, while a few others are held in the amazing Irish World Academy Building, all part of the Campus. In and around the workshop venues will be work exchange rooms, cafes, restaurant and pubs where you will have choice of different menus. Campus facilities include a supermarket, bank, laundrette and print facility on site. For the Congress, there will also be a dedicated registration and information area, a bazaar where you can buy all things Alexander, and a book shop within five minutes' walk of the main University building. UL has an abundance of cultural resources including the second largest art collection in the Irish University sector, Ireland's first purpose built concert hall and a range of galleries, exhibition and performance spaces and public sculptures. The University is home to the Irish Chamber Orchestra, the National Self Portrait Collection and other private and public art collections. The University of Limerick now has more than 1,800 paintings, drawings, prints, sculptures and decorative objects on campus - for more details follow this link: UL Campus Art Trail. You can download it here (4Mb file), though please note that it will also be included in the printed programme. 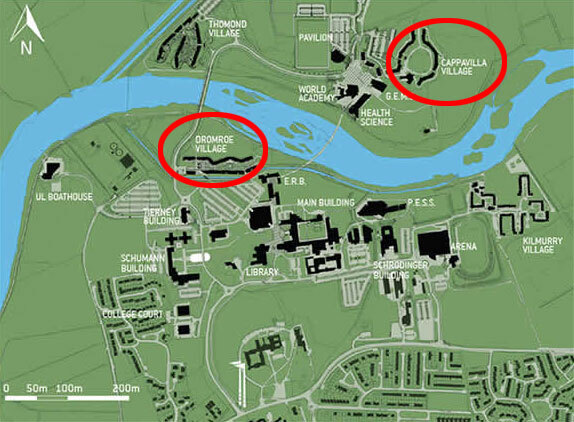 The map below show the location of Cappavilla and Dromroe Villages (circled) - these have been reserved for the Congress accommodation. The standard UL printable map with legend (showing main buildings) is downloadable here. The indoor Sports Complex, the UL Arena, has a diverse range of sport and fitness options which are unmatched anywhere in Ireland. It is the most modern and extensive sports complex currently available for training and competition needs, with comprehensive outdoor sports facilities all within a 800m radius. 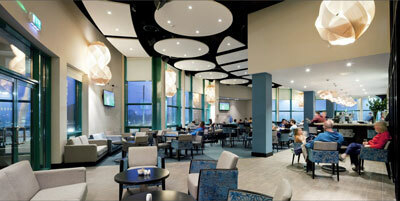 In addition to the indoor facilities there is a outdoor running track, playing fields and tennis courts. For more details visit their website and/or the Shannon Region website. 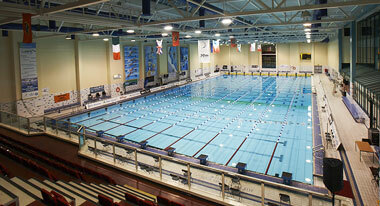 You can buy a pass for €10 which will give you access all the sports facilities of University of Limerick for the week. You can purchase your pass at the Congress Information desk. The University campus, set in 300 acres of beautiful riverside parkland, provides a relaxed, convenient, scenic and self-contained environment for delegates during their stay. 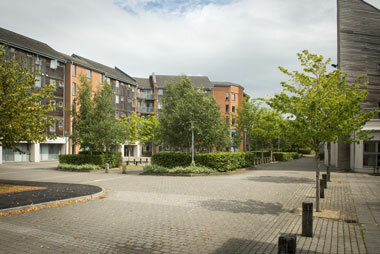 Congress delegates are urged to choose accommodation in the unique atmosphere of the UL campus. All accommodation that is included in the registration fee is within 5 to 10 minutes' walk of the workshops and special presentations locations. The walk from the accommodation, via the incredible 'Living Bridge', to the central areas of the campus offers stunning views over the Shannon River. A great start to the day. Please see our accommodation page for more details about your accommodation choices. There are several free car parks around the University and also at the accommodation. For people staying on-site, Cappagh Village has its own car park, and Dromroe Village is near the Foundation Building car park. For all Congress participants, including those staying off-site, the most conveniently located car parks are the Foundation Building car park, and the Pavilion car park. Both provide plenty of free parking spaces. These car parks are numbered 1, 16 and 17 on the UL car parking map, available online here. If you need further information about parking at UL, see UL visitor parking page. For those staying on campus continental breakfast will be delivered to your apartment each morning and will consist of: Brown bread, cereal (porridge/muesli), fruit/yoghurt, juice, jams and peanut butter, low fat spread, butter, milk, sugar, tea, herbal tea and coffee. For lunch and dinner (not included in the Congress fee), you have the choice of self-catering or a variety of restaurants and cafés on campus including the Pavilion Restaurant. The Gala Dinner on the Friday evening is included in your Congress fee and is the opportunity for us all to share a special final meal together. Please see our food & drink page for more details about choices available during the Congress.